Normal Community West soccer goalkeeper Lexi Modglin, right, talks with teammates during a practice at the school Wednesday, March 21, 2012. 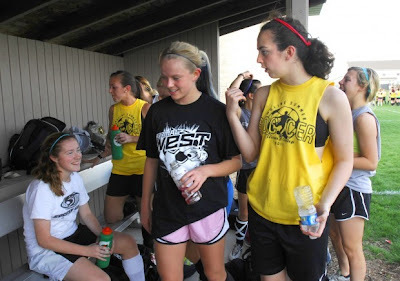 Modglin and most of her teammates will not be going away on spring vacation because of thier dedication to soccer. NORMAL Fla. — Lexi Modglin’s mother and grandmother will spend spring break in Marco Island, Fla., but Lexi will stay here for three soccer games and practices that start as early at 6:30 a.m.
Sports events – and activities at libraries, museums and clubs — are abundant during spring break, planned next week for schools in Bloomington District 87, McLean County Unit 5 and some parochial and rural schools. Lexi’s mom, Peggy Modglin, is a Normal West teacher whose family usually has a spring vacation. She plans to stay in touch to follow her daughter’s 18-member team in league and inter-city tournament play. The team has scheduled two early morning practices, leaving enough time in the day for students to enjoy other activities. Lexi already plans to spend one day at Navy Pier in Chicago. With so many students off at the same time, community organizations have planned plenty of entertainment. On Tuesday, Bloomington Public Library is introducing Spare Parts, when teens and a younger child pair up for a craft made from recycled materials. “I hope they come up with some wicked cool things,” said spokeswoman Rhonda Massie. Normal Public Library will have a combined Family Movie and Game Day from 10 a.m. to 4 p.m. Wednesday. Movies start at 10 a.m. and 1 p.m.; board games are available all day. The Salvation Army has planned more activities off-site to reach new people, said Capt. Paul James. The agency is working on activities with the Boys and Girls Club of Bloomington-Normal; also providing fun are the Children’s Discovery Museum in Normal and the Illinois State University Planetarium. Children and families can wrap up the week on March 31 with an Easter egg hunt at the Corn Crib in Normal.